Rolland, Romain. 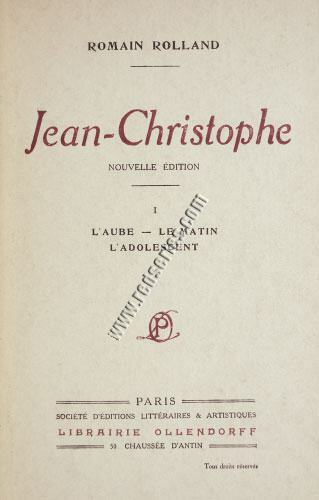 Jean-Christophe. Nouvelle Édition. 4 vols. With sheet music illustration of a chanson and 3 further ones of 1-2 lines. Paris, Ollendorff, (1921). 8⅜ × 6¼ in (21.2 × 15.8 cm). Contemporary dark red leather inlaid master bindings on three covert bands with orig. wrappers incl. 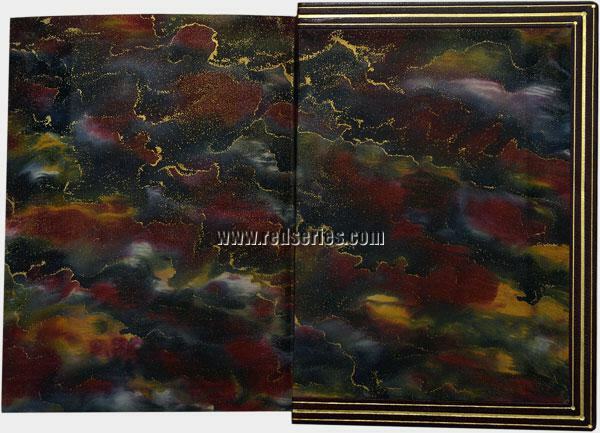 back bound with, the front of which in reddish brown & black. Gilt head edge. 2 edges uncut. Verified collation: 3 n. pag. preliminary ll., IV, 455, 1 pp. ; 3 n. pag. preliminary ll., 541 pp. ; 3 n. pag. preliminary ll., 495 pp. ; 3 n. pag. preliminary ll., 411, 1 pp. 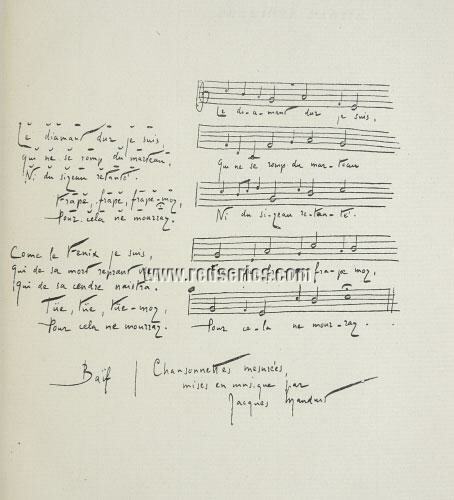 The chanson with the verses Le diamant dur je suis and Come le Fenix je suis by Jean-Antoine de Baïf (Venice 1532 – Paris 1589), set to music and published 1586 in the Chansonnettes mesurée de Jean-Antoine de Baïf by Jacques Mauduit (1557 Paris 1627). The former initiator and co-founder, the latter from 1581 principal musician of the Académie de musique et de poésie, that secret association under the patronage of Charles IX which aimed at reviving the ancient Greek metric in contemporary French poetry and music. with written inventory number 2602(-05). – Spine of vol. I lightened to reddish brown and so tapering off in a strip of 1⅝ × c. 3⅛ in (4 × 8 cm, maximal) at the top of the back board. As a result of a previous wrapper the far edge of the white sheet following next to the front free endpaper of vols. I & III with slightly shaded/discolored longitudinal stripe 3 cm wide and that of the 3rd volume besides with four faint small/tiny fox spots. In this vol. 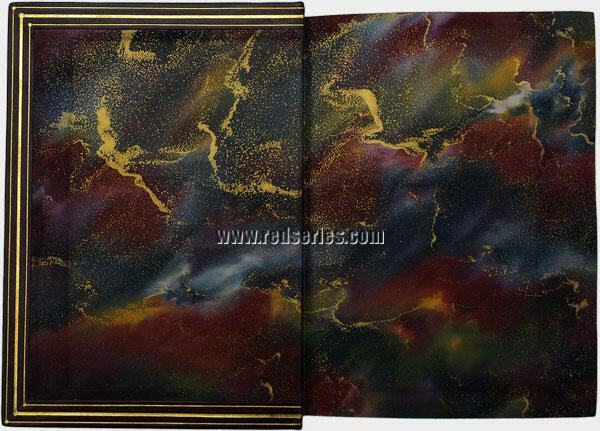 only the white back of the lower free endpaper correspondingly slightly striped, while the white sheet following next shows the stripe likewise, but distinctly brownish. Otherwise of perfect freshness. 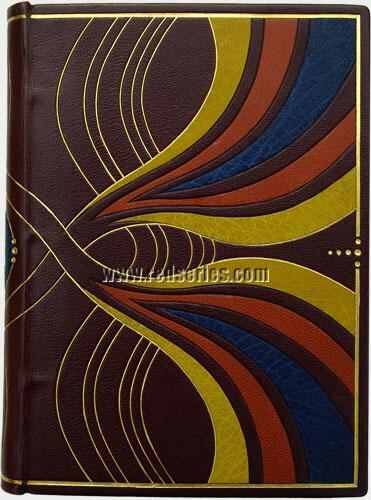 of variously colored leather tapering off inwards from the outside, in turns from top to bottom mustard yellow – light reddish brown – blue – light reddish brown – mustard yellow – mustard yellow – light reddish brown – blue – light reddish brown – mustard yellow, each interrupted by the variedly wide dark red of the cover, with reddish brown uniting with the next reddish brown in the tip. The lining fillet interrupted in the middle of the boards and top & bottom of the spine by four gilt dots each tapering off inwards horizontally and vertically resp., above and below the farest of the middle of the boards again one dot each, from which four horizontal and three vertical dots result. Four times three dots interrupt the tooled gold line, too, of the oval blue spine label R. ROLLAND / JEAN / CHRISTOPHE / I (to IV). 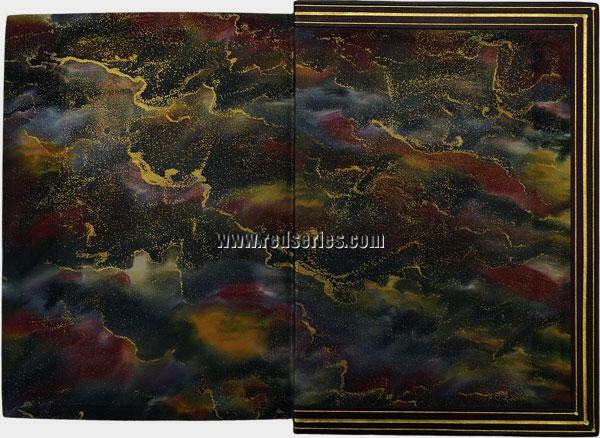 The edges of the spine-ends gilt tooled with I II I II I II I. The headbands with eight orange-colored linings. The leading edges with single, the inner dentelles with triple fillet lining the paste-down, of which the one in the middle is wider. an ecstacy , a dream , world within as antithesis of the exterior pretense . only creating the complete artwork sui generis. Also see corresponding emphasis in the sample plates 6-9 of Paul Kersten’s (Breslau master binder) Der exakte Bucheinband, 4th ed., 1923. “ The sweetness, the tribulation of friendship opening up the great human family through conflict to the isolated heart … The murmuring of the river rises from behind the house … Once more Christophe stood gazing down from the staircase window. All his life flowed before his eyes, like the Rhine … And Christophe … saw the river overflowing its banks, covering the fields, moving on, august, slow, almost still ” (each from the English translation by Gilbert Cannan). It would take another seven decades before East German director Horst Seemann would build on Rolland’s statement, having Beethoven marching behind his ancient moving van amidst modern-day traffic on Vienna’s streets in the 1976 DEFA production Beethoven — Tage aus einem Leben / Days in a Life. in every trait , every movement , every thought . (Sven Söderman, Biographical-Critical Essay, Presentation of the Nobel Prize for Literature in 1915 ). 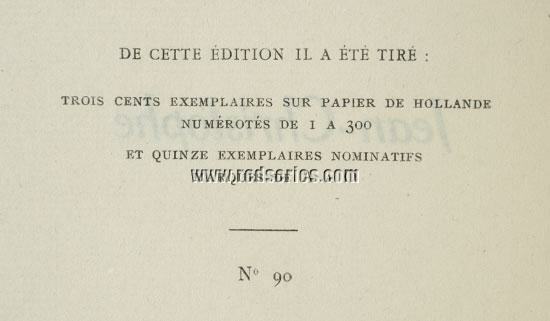 (Encyclopædia Britannica Online, Jul. 17, 2017). (Heinrich Schreiber in Löffler-Kirchner, Lexikon des Gesamten Buchwesens, II , 303 f.).